How many veterinary students does it take to cut off a cast? 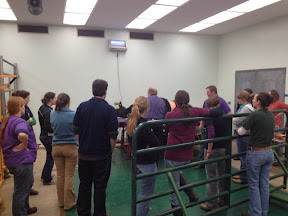 I am teasing about that, but it did strike me as funny when I took my yearling heifer back to the veterinarian to have her cast removed and the room filled with students interested in helping and learning. Six weeks ago when we found this beautiful registered Angus heifer in the pasture limping, we called the vet school at Kansas State. They have a great facility and the ability to do surgery. 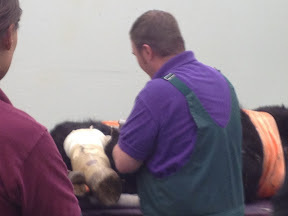 It turned out the heifer needed two pins and a cast to heal the bone. After 6 weeks she is looking good and ready to have the cast removed. They first gave her a light tranquilizer to calm her and laid her on a tilt table to have access to the leg. It took about 30 minutes to remove the cast and pins. She is doing well today. But I tell you this story to highlight a very serious problem. Large animal vets are becoming a dying breed. They work long hours and take call every day, of course. But most of the work they do it's outside in the weather and with large animals who don't necessarily want to be worked on! It is physically and emotionally draining as well as for low pay! But my local vet is very dedicated and we do our best to take good care of him when he comes to our house for work--whether it is emergency work or regularly scheduled. It is a big concern in many areas that the sheer number of vets has declined and fewer of them are willing to work late or in difficult conditions. I don't know the answer to this problem, but a knowledgable and dependable vet is invaluable to a rancher. A concern for us as well...our vet at the sale barn is 60 yrs old and we have this conversation often. Who is going to take care of the large animals???? I'm all about encouraging those going into vet school to go with large animals! We support the vet school whenever we can, but it is also important for us to support our local vet. We need to show students that it is not all about the money or the hours--it is about the way of life and the satisfaction of helping animals and people. In really rural Ne the vets are getting older (retirement age) and there are very few new vets to take over these practices. Very Scary!! We are lucky that our vet's son recently graduated vet school and has joined his dad. We give him all our business... knowing there is a younger generation to take over is a huge relief!! You are lucky! Our vet has no sons in vet school, but he has hired a great guy fresh out of school who may be able to stay as our vet slows down. I really hope so! We are blessed to have a very dedicated and educated vet for our horses. They are defitely something to not take for granted! You are very kind, memory! I don't know that I am very "famous" but maybe I was the only one they could get to stand still for the photographer! My cows certainly enjoyed it!! Thanks--and I'm honored to know YOU too! !